Does your business have a Facebook page? Have you ever wondered what successful Facebook page owners are doing right? Well, look no further. This article examines 10 of the top Facebook pages from brands you’ll likely recognize. Regardless of the size of your business, you’ll discover great ideas that will help you take your Facebook experience to the next level. Each of these pages has incorporated unique features that have attracted hundreds of thousands (sometimes millions!) of fans and attracted the notice of major media publications. That’s a pretty big feat, considering there are thousands of new pages popping up on Facebook daily! There is no need to reinvent the wheel. Instead, check out what others are doing and tweak these strategies to make them your own! The team behind the Red Bull page is extremely in tune with their target audience. This is evidenced in their custom apps and unique content throughout their page. Red Bull knows what their audience will respond to best and they deliver it. 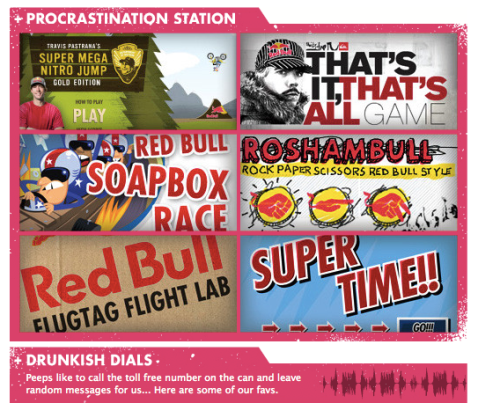 For example, they’ve created a series of online games for their fans, aptly called the “Procrastination Station.” The games are geared toward sports and high-impact competitions. 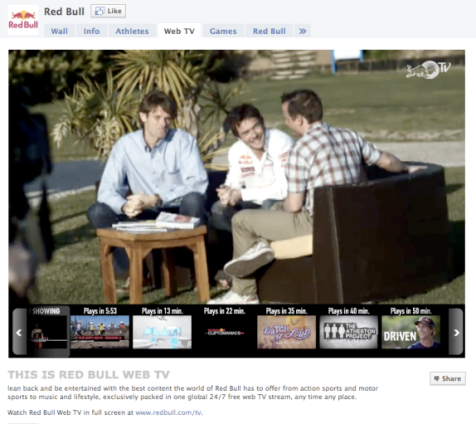 In addition, Red Bull created a web TV program that’s highlighted on their Facebook page. There are multiple segments, many spotlighting the lives of their sponsored athletes. Not only is the web TV show a great way to align with celebrity athletes, but it is also a way to incorporate video into the page, thereby giving the audience another way to interact. Another smart feature of Red Bull’s page is their welcome tab. When a non-fan lands on their page, he or she sees the image below. 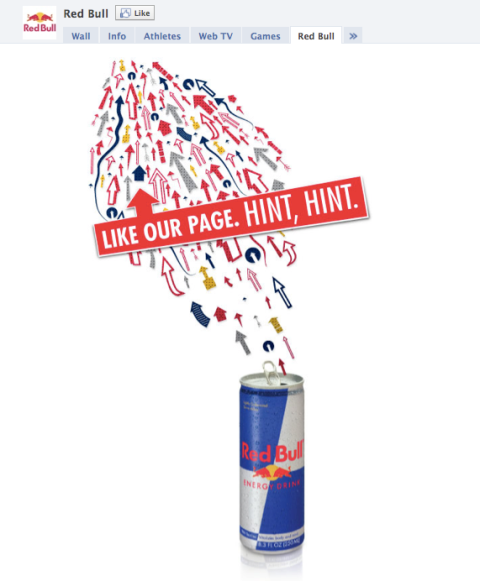 Red Bull creatively encourages fans to “Like” their page with an attention-grabbing image. Also, they only put one thing on their welcome tab, making it very clear what they want to happen. When you add too much to your welcome tab, your fans will get confused and likely not take any action. Less is more. Stick to one call to action. Tip: One area you might want to consider spending a little money on is creative design for your page. Design, when done right, makes a great first impression for non-fans. Also, when you design your Facebook page, pay close attention to your call to action, specifically for the “Like” button. What can you do to grab the attention of your new viewer and encourage him or her to click on your “Like” button quickly? Red Bull’s creative design on their welcome tab does just that! 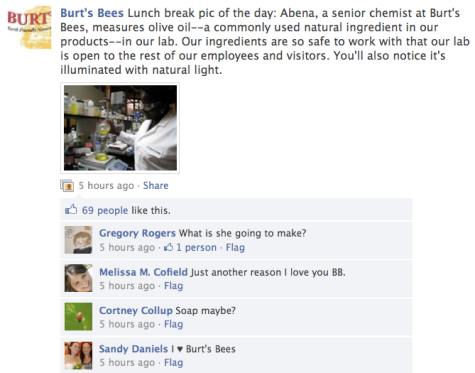 One of the best features on the Burt’s Bees page is their use of photos and video. They use the photos and videos to give a behind-the-scenes view of their company and products. In the image below, notice how Burt’s Bees not only mentions the type of ingredients used, but they also suggest their ingredients are safe and they welcome all visitors into their lab. This is a great example of a way to promote your company and products, while adding value in the form of interesting details. Tip: We all have something unique about our products or services and Facebook is one of the best places to highlight this. How can you incorporate video or images to help you stand out from your competition? Uno Chicago Grill has taken full advantage of the Facebook app FBML to highlight their menu options in an extremely appealing way. They have many tabs dedicated to specific areas of their menu and use imagery to entice their fans. In addition, on their welcome tab they link to the most important areas of their website, including locations and online ordering options. 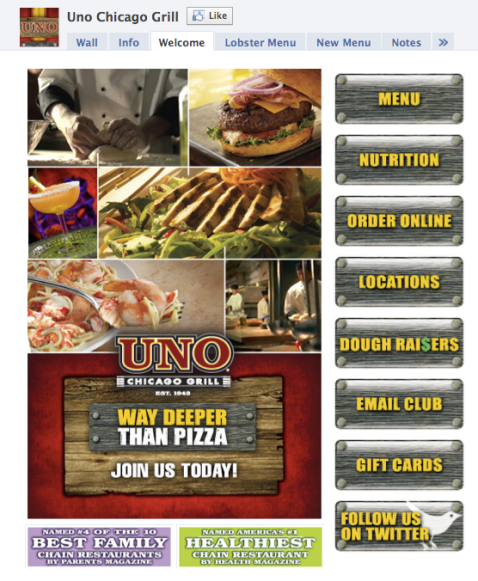 When non-fans come to their page for the first time, they get an instant snapshot of Uno’s offerings. In addition, Uno has incorporated a Fan of the Week contest on their Facebook page. Fans get their photo posted directly on the profile image of the restaurant’s wall. This is great exposure for the fan, making it a fun activity to participate in. To take it one step further, Uno does something unique with their Fan of the Week contest—they ask fans to post photos of themselves while at an Uno restaurant, thereby encouraging fans to come in and dine. This is a great way to bring their online fans into their brick-and-mortar establishment! Tip: If you have a brick-and-mortar establishment, think of creative ways to entice your fans to visit in person. Contests, promotions and special offers are all great ways to invite new fans to come in and check things out! LiveScribe has incorporated two features into their page to help them sell more products and cut back on support calls. First, they’ve created a savvy storefront as one of their tabs. 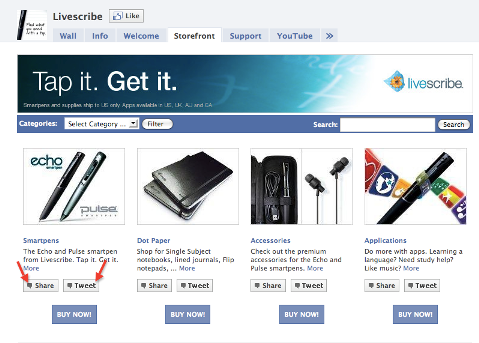 Not only can you buy directly from the Facebook page, but you can also tweet about their products and post about them on your Facebook wall. These two options help create greater exposure for LiveScribe’s products. When your friends see that you’re posting about a new product, it’s natural for them to want to know more. 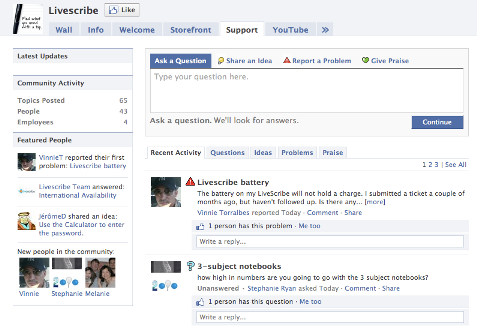 In addition, LiveScribe has incorporated a support desk directly into their Facebook page. As you can see below, you can ask a question, share an idea, report a problem or even give praise directly from their Facebook page. What’s even more important is that others can see these posts. 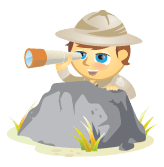 Fans and potential buyers can then go to this tab to get answers or see what others are saying about the products. It’s another great way to educate fans about your products and services. In addition, this tool can cut down service calls when executed correctly, saving your company time and money. Tip: If you’re providing a product or service, consider incorporating a support feature to your page. It’s common for customers to use social media sites to post questions or complaints. If you provide a designated place for support, you’re likely to keep your customers happy and turn them into repeat buyers! Toy Story 3 has done an exceptional job of making their page both fun and functional. The fun factor is expressed in their new application, Toy Creator, where you can turn yourself into an animated toy. Both kids and adults can get in on the action and then share their new creation on their Facebook wall (yet another viral exposure opportunity!). 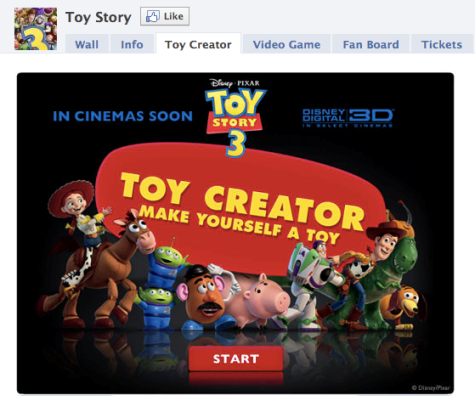 To make their page functional, they’ve built a tab where you can purchase movie tickets without ever leaving Facebook. This makes ticket buying easy and fast for their fans. Tip: Keep your fans inside Facebook as much as possible. Bring your content, unique experiences and buying opportunities to them instead of making fans leave the site to interact with your business. Your chances for greater interactions and a bigger return on investment will dramatically increase the longer you keep them on your page. Coca-Cola has secured their spot at the top of many best-of-the-best Facebook page lists due to their innovative promotions and fun, interactive features. 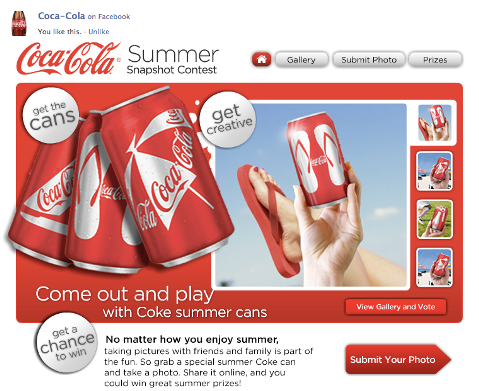 Their latest promotion is the Summer Snapshot contest, where they encourage their fans to take photos with the summer Coca-Cola cans. Not only does this get fans involved with their page, but the contest also incorporates photos of their products with fans. Photos are viewed more than anything else on Facebook. They go viral quickly because when a fan posts a photo, that photo is then sent out to the news feeds of all of their friends. Hundreds of thousands of potentially new fans will see these photos. 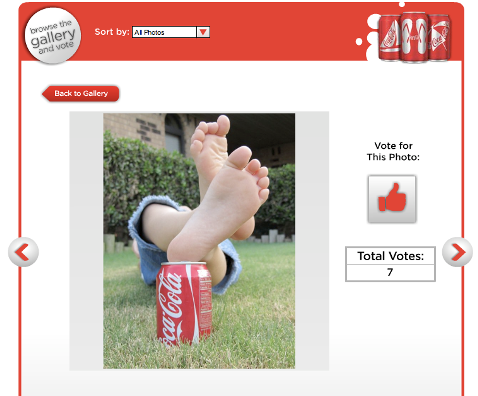 Here’s an example of a photo a fan posted for the Coca-Cola contest. Notice how others can vote on the photos? This allows everyone to get in on the fun. 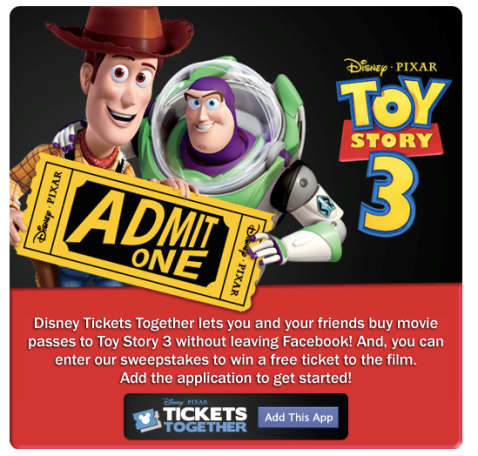 Tip: When creating a contest, keep it simple. The less your fans need do to enter, the better. Make it easy, fun and make sure to incorporate a sharing component so your contest spreads virally. Oreo does a fantastic job of creating unique experiences for their fans. Oreo knows that their cookies have been part of many people’s lives since childhood and they use this angle to create nostalgia with their fans. And it’s working for them because they have over 8 million fans to date! One of their latest campaigns is their “Back to School Memories” campaign where they ask their fans to share their memories and photos directly on their Facebook page. 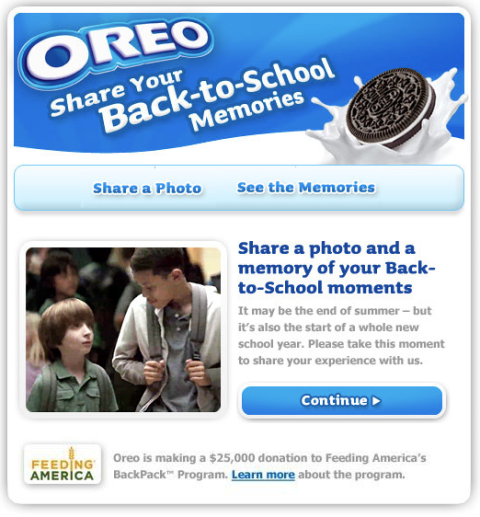 By offering unique experiences like Oreo has done with their back to school campaign, brands create a connection to the fans, who become loyal followers and keep coming back for more. Tip: You’ll get a much greater response when you ask your fans to share something about themselves. Ask them their thoughts, opinions and feedback and you’ll be pleasantly surprised how quickly they start talking! Jones Soda does a great job of incorporating many different ways for their fans to interact with their page. Not everyone communicates the same way, so providing multiple options is a smart strategy. 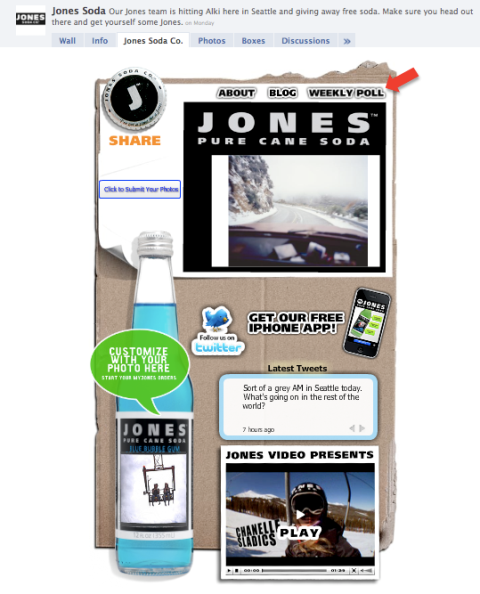 Specifically, Jones Soda does a weekly poll directly from their welcome tab. Polls are a great way to learn more about your audience as well as a fun strategy to get them to interact with your page. Tip: Think of different ways to get your fans to engage with you. Polls, contests, questions, iPhone apps and videos are just a few different ways to reach your fans. All fans are different; make sure to provide options. No matter if you have seen the movies or not, you can’t deny that the Twilight Saga is hot. There are two strategies they’ve launched on their Facebook page that you can model for your own page. 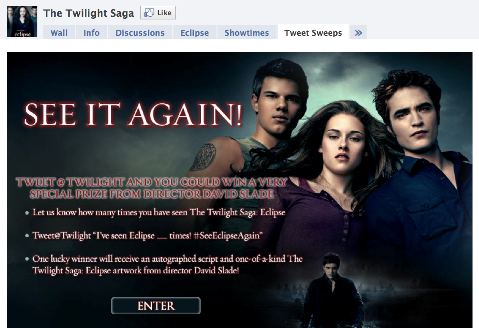 In addition, the Twilight Saga page has taken advantage of the “Discussion” tab where fans can post topics of discussion and all fans can join in and comment. The discussion tab creates a great sense of community and dramatically increases the engagement on the page. Tip: To encourage more conversation among fans on your page, start a few discussion streams to get people talking. Once this takes off, your fans will continue to post discussion topics on their own and the page engagement will grow organically. The Travel Channel has done something unique on their page that’s worth checking out. 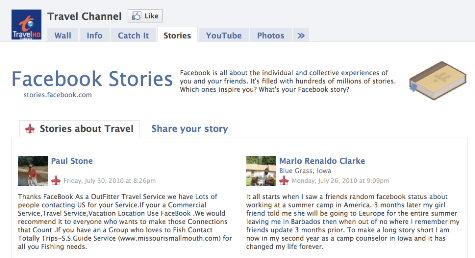 They’ve created a space for their fans to share how Facebook has played a part in their travel experiences. You can post your own story or just read what others have posted. It’s a creative way to get people with similar interests to engage with your page. Tip: Facebook Stories can be incorporated on your page as well. Go here to see how it works and check out the different story themes offered. What do you think about the above Facebook pages? Have you tried any of these techniques with success? Let us know! Please leave your comments below.